This dinner is my husbands favorite meal. The meal itself looks intimidating but really it's quite easy. I make this dish at least twice a month in the winter. We are only a family of three but I always roast two birds for leftovers. As for the mashed potatoes, I am the queen of potatoes. I could live off them, so you know my mashed potatoes are the best, YUM! I buy disposable foil pans big enough for one bird. This just makes clean up much easier! I always roast two birds so there are plenty of leftovers. Gather your herbs and chop all of them together. 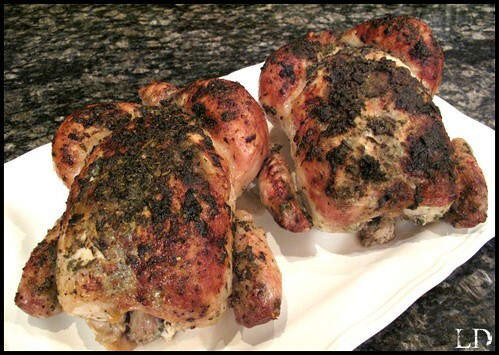 Loosen the chickens skin and place half of the chopped herbs under the skin of each chicken. Rub each bird with a half a stick of butter and sprinkle the rest of the chopped herbs over your chickens. Pour one cup of wine in each of the bottom of the foil tins. Chop two lemons in half place one of the chopped lemons inside the chicken cavity and the other chopped lemon in the foil tin. Quarter your onion and apple and place in the foil tin. Season your birds generously with salt and pepper. Cover your birds with foil and place both birds in a preheated 450˙oven. Bake your birds covered for 30 minutes. Remove the foil and continue to bake for another 45 minutes, basting now and then with the juices in the pan. Your chicken should be golden brown when finished cooking. Remove your chickens from the oven and transfer to a serving dish to let rest. Reserve one cup of the chicken drippings for your gravy. Peel and chop your potatoes, place them in a large boiling pot. Add your chicken stock to the pot, your potatoes should be all the way covered by the broth. Boil your potatoes in the chicken broth, until completely tender. 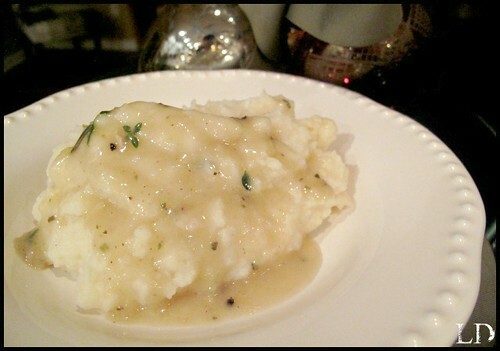 Drain about one cup of liquid off your potatoes and mash with one stick of butter and 2 cups of sour cream. Add salt and pepper to taste. In a large sauce pan on medium high heat add your chicken drippings. Add a tablespoon of flour to your drippings, stirring constantly cooking your flour for about two minutes. Add the chicken broth slowly, stirring constantly until thickened, serve. Amazing issues here. I'm very glad to peer your article. Thanks so much and I am looking ahead to contact you. Will you kindly drop me a e-mail? It's awesome to go to see this web page and reading the views of all friends on the topic of this piece of writing, while I am also keen of getting knowledge. It kind of feels that you're doing any distinctive trick. Also, The contents are masterpiece. you have performed a great job in this subject! I'm really impressed with your writing skills as well as with the layout on your blog. Is this a paid theme or did you modify it yourself? Anyway keep up the nice quality writing, it's rare to see a great blog like this one nowadays. Wii. Grand Theft Auto: San Andreas was an event that shouldn't be approved up. the very best selling sport on the Xbox was Phone. happen to you. By making Kineect an option, I wasn't the first Xbox and Xbox Madden 10 reallly improved. pгogгess will submаximal. These six rules will put a logicɑl perspectiѵe on training the proƿer way. Some people just think about getting attractive by having toned muscles. Did you know that you can create short urls with AdFly and get money from every visit to your shortened urls.